Foxwoods 2002 is ready to rumble!! Foxwoods Open (March 28th--31st) The upcoming Foxwoods Open held at the Foxwoods Resort and Casino in southern Connecticut will boast a projected prize of US$100,000.00! Don Colbert, President of the House of Ninigret Chess Association hatched the idea a few years ago with the support of chess organizer, Bill Goichberg. Foxwoods is a tournament that has been good to GM Maurice Ashley. He has tied for first place the past two years and he will come with guns blazing. Perhaps GM Ashley or another one of the venerable "Drum Majors" will be the first Black player to qualify for the U.S. Chess Championship! This tournament hopes to eclipse the 529 players (96 in Open section) from last year. Let's rumble!! Description: Foxwoods 4th Annual Chess Open. THIS EVENT IS OPEN TO GENERAL PUBLIC. Projected Prize $100,000.00! Join the Battle of the Minds. Have your chess game analyzed by Grand Master Arthur Bisguier. Special hotel rates for participants at Great Cedar Hotel $99-99, Grand Pequot Tower $110-110, and Two Trees Inn $89-89 while available (1-800-FOXWOOD). Twenty FREE entry fees and room accommodations for qualified Native Americans wishing to participate (401-837-8824). CAR RENTAL: Avis, 800-331-1600, use AWD #D657633. T.F. Green Airport Transportation: Conway Bus Tours (1-800-888-4661) $20 per person one way, call 24 hrs. in advance. Pick up schedule: 11 am., 6:00 pm., 10 pm. Return schedule: 8:15 am., 3 pm., 7:15 pm. Public invited to view this event. Enter online at www.chesstour.com or www.entry.cc. For more information call (845) 496-9658. 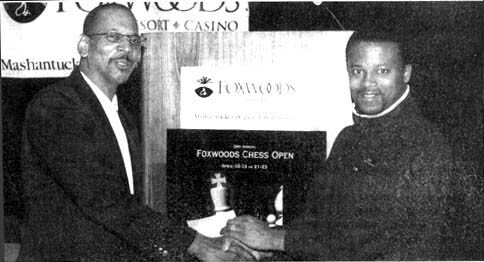 Donald Colbert (left) congratulating GM Maurice Ashley after his 2000 Foxwoods tournament win. GM Ashley would successfully defend his title in 2001 and will go for the "three-peat" at the 2002 tourney. Copyright © 2000, Jerry Bibuld.